We will now look at the distributive laws for three sets. 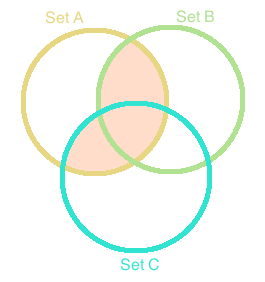 Theorem 1 (Distributive Law 1): If $A$, $B$ and $C$ are sets then $A \cup (B \cap C) = (A \cup B) \cap (A \cup C)$. We now want to show that $(A \cup B) \cap (A \cup C) \subseteq A \cup (B \cap C)$. Let $x \in (A \cup B) \cap (A \cup C)$. Then $x \in A \cup B$ and $x \in A \cup C$. So $x \in A$ or $x \in (B \cap C)$ so $x \in A \cup (B \cap C)$ and so $(A \cup B) \cap (A \cup C) \subseteq A \cup (B \cap C)$. Therefore $A \cup (B \cap C) = (A \cup B) \cap (A \cup C)$. 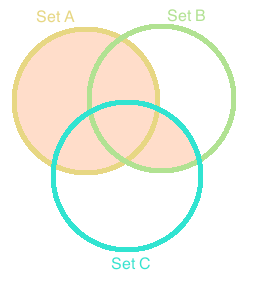 Theorem 2 (Distributive Law 2): If $A$, $B$ and $C$ are sets then $A \cap (B \cup C) = (A \cap B) \cup (A \cap C)$. Proof: We first want to show that $A \cap (B \cup C) \subseteq (A \cap B) \cup (A \cap C)$. Let $x \in A \cap (B \cup C)$. Then $x \in A$ and $x \in B$ or $x \in A$ and $x \in C$. Then $x \in (A \cap B) \cup (A \cap C)$, and so $A \cap (B \cup C) \subseteq (A \cap B) \cup (A \cap C)$. We now want to show that $(A \cap B) \cup (A \cap C) \subseteq A \cap (B \cup C)$. Let $x (A \cap B) \cup (A \cap C)$ Then $x \in (A \cap B)$ or $x \in (A \cap C)$. So $x \in A$ and $x \in B$ or $x \in C$. So $x \in A \cap (B \cup C)$, and so $(A \cap B) \cup (A \cap C) \subseteq A \cap (B \cup C)$. Therefore $A \cap (B \cup C) = (A \cap B) \cup (A \cap C)$.